I’m savoring a brief period of relative comfort from a lingering cold. I can’t imagine how I’d handle something serious like the flu. I’ve already had my flu shot for this year, though I fully understand that I’m not protected from nearly half of the strains that may spread this season. Still, I have just enough grasp of the science to know better than to skip the flu shot because it’s not 100 percent effective. I religiously wear seat belts for just the same reason. As I’m more or less coherent this afternoon, (following a good nap during which I added a sleeping bag to my covers), I reflect back on the history of one century ago. The Great War’s centennial is certainly a topic under constant consideration by history buffs, but as I type next to a box of an ever-present box of Kleenex with lotion, I glance up at a book in my shelves, one of the most memorable I’ve ever read. John M. Barry’s account of what was incorrectly been labeled the Spanish Influenza of 1918-1919, is a detective story at its heart. 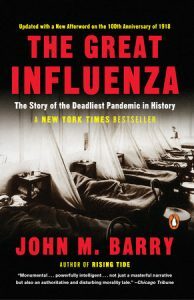 In the 2005 bestseller, The Great Influenza-The Story of the Deadliest Pandemic in History, Barry painstakingly takes the reader to a time when many physicians still routinely practiced bleeding of the patient as a means to improve health. While we may think of 1918 America as relatively modern, many of our institutions were hopelessly antiquated or inadequate to meet the needs of its purpose. The U.S. Public Health Service, founded during John Addams’ presidency in 1798, was woefully understaffed, though with very dedicated physicians. Fortunately for no doubt millions, there had been a recent revolution in medicine just prior to the First World War, which was to play a key role in the rapid transmission of the flu virus. Several medical universities were transforming the understanding of a number of killers. The knowledge gained at these centers had diffused to such leaders as the U.S. Army’s Surgeon General and Johns Hopkin’s future head of the pathology department. These experts in their respective fields collaborate, often times by happenstance, to track the virus as it circles the globe no less than three times, returning with each wave a new, more deadly variant than the time before. It wasn’t until the second wave that public officials took steps to prevent the spread of influenza and the medical community innovated to treat those afflicted by the lethal virus. Hundreds of medical caregivers contracted and died of the flu during 1918-19. The Great Influenza most likely had its origins in the United States. Specifically, a rural county in Kansas near what is now Fort Riley. It’s believed the virus was spread by doughboys heading to France, stopping at various training facilities throughout the Eastern U.S.
Science did not defeat the virus. In fact, the virus remains to this day, mutated into a form not deadly to humans in its current, though ever-changing state. The respiratory illness that killed at least 50 million people worldwide, (many researchers believe the total number of deaths at twice that count), is one mutation away from returning. In this surreal political phenomenon that has been the past two years, otherwise important news stories are eclipsed by newsworthy, but not informative topics. This past summer had brief coverage of a policy proposal most of us missed. The organization? The U.S. Public Health Service Commissioned Corps. Read Barry’s book. It’s a pretty sure bet few running the country have.